A Place By Damao, styled BYDAMAO.COM on its English signage, has been open for around six months in a rather unassuming storefront on Halsted in Bridgeport. I wasn't sure at first, around the time they first opened, what kind of business it was, since the signage was very ambiguous and there were not any pictures of food items on the windows to indicate what might be inside, but I am glad I went in to satisfy my curiosity. It's a great little cafe, with only few tables, churning out Chengdu-style delights with charm and characteristic málà flavor. This is a small, family operation (the young man, who I think is the owner, is from Chengdu), but the flavors and homey atmosphere remind me in ways of Tony Hu's Lao Sze Chuan in the old days when I first encountered his fare (c. 2005), before he went on to conquer the world and Las Vegas. It's stimulating, satisfying stuff at an excellent value, with plenty of weirdness to satisfy foodies. The menu, though, is quite small, and it does not make any concessions to the Americanized palate. This cafe caters to the local Chinese community, including students studying here from overseas. The menu consists of Sichuanese spicy braised dishes, barbecue (including rabbit), and Sichuan standards such as bell dumplings (钟水饺), homemade sausages, sweet-and-spicy noodles (甜水面), and vegetables/meatballs in málà broth (a vegetarian version is available). There are even a couple desserts. I ordered "iced water cake with fermented rice" (酒酿冰粉) without having any idea what it would be, and I was delighted to receive a sweet, slightly boozy gelatin, served very cold, which was a perfect ending to an otherwise fiery, mouth-numbing meal. All that, and you only tell us about a freekin' dessert? For real, thanks for the heads up! I loved the food on my first visit here! Just past the 55 underpass on Halsted, driving south on this stretch hundreds of times, I'd never noticed a strip mall set off the road (you can park right in front!) This same strip houses Taipei Café (which we bang-banged afterwards, sharing a few cold apps which were decent and a milk tea which was lovely). APbD is a hole in the wall, to be certain. Bright and clean though, with a cold holding unit proudly presenting the offal offerings du jour. Menu design is user friendly and hip with cute illustrations. The spot was jumping with young and presumably Chinese clientele at 12:30. 3/4 of these dishes make the tippy top of best-things-I've-eaten-this-year list status. Duck tongues. Served cool from the case, this was the weakest link of the lunch. Good though, all about that cartilaginous texture. Simply dressed in maybe just chile oil. 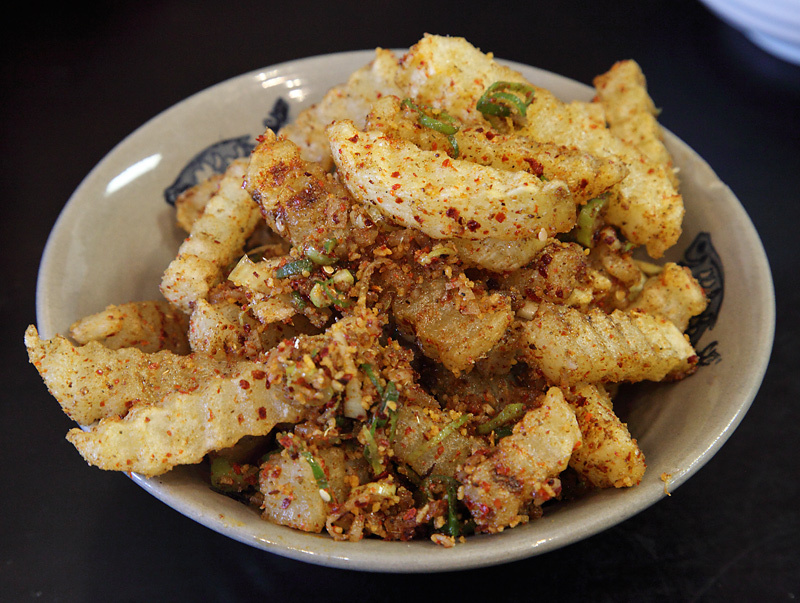 This had me pining for the dry chili version at Double Li. 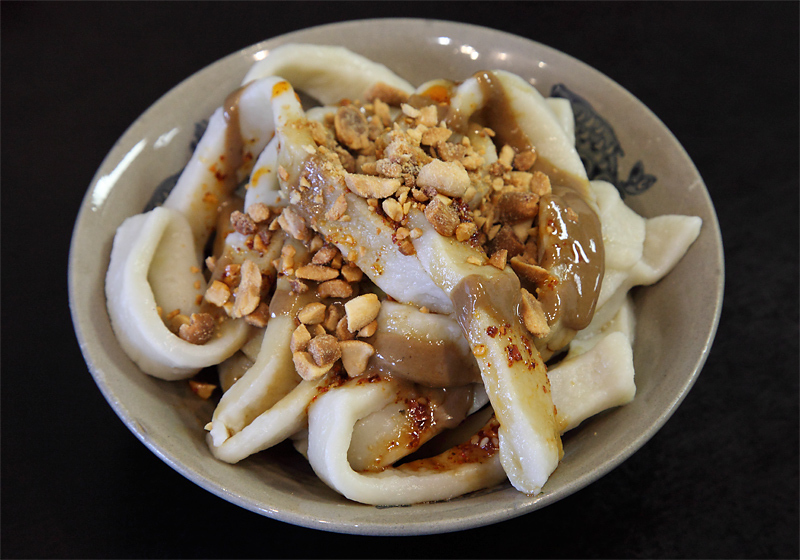 Spicy soft bean curd. We were expecting a mapo dish. But as you can see, this is a rather sophisticated, composed prep. Almost as dainty as a good chawanmushi, but with bolder toppings, of note were the crispy roasted soybeans. Wontons in hot soup. We were planning to order the bell dumplings, but laikom spied this deep bowl of demonic stuff wafting by us to another table. The ambiguous name on the menu is easy for the eyes to skip over, but hot damn, am I glad we ordered this. If this thing is prepped consistently, this dish has the promise of an LTH all star in the making. Supple dumplings filled with pork and a yet-to-be-identified filling with a vegetal crunch bobbling beneath the surface of volcanic liquor straddling the soup/sauce divide. Slap-your-face mala on par with (the 100% on point lately) dan dan at Katy's. 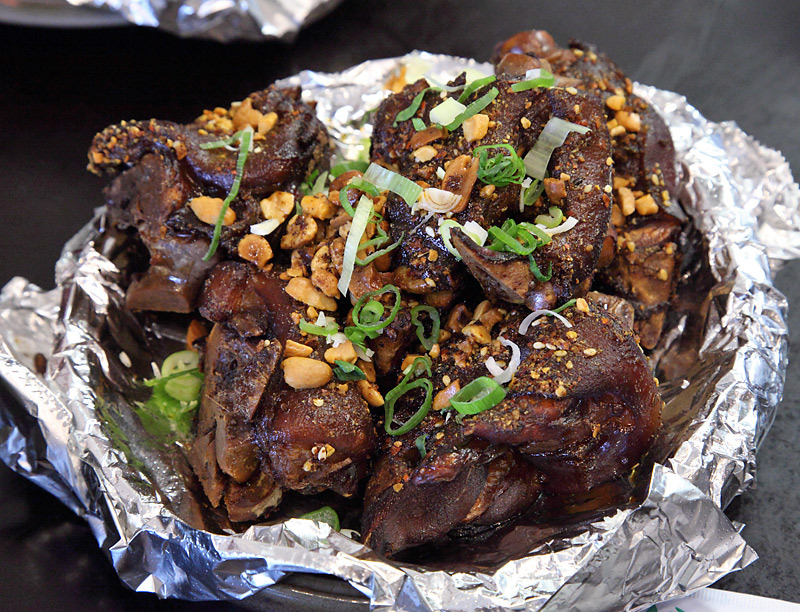 Roasted pig feet with peanuts. Nick K at the Trib did a profile on this one recently, which was probably my inspiration to check this place out. This stuff did not disappoint. I'd call this more ankle than trotter, joints encased in jiggly, fully rendered skin and cartilage with a few meaty bits. So much gelatin that napkins were completely decimated by sticky fingers, embarrassingly so even. 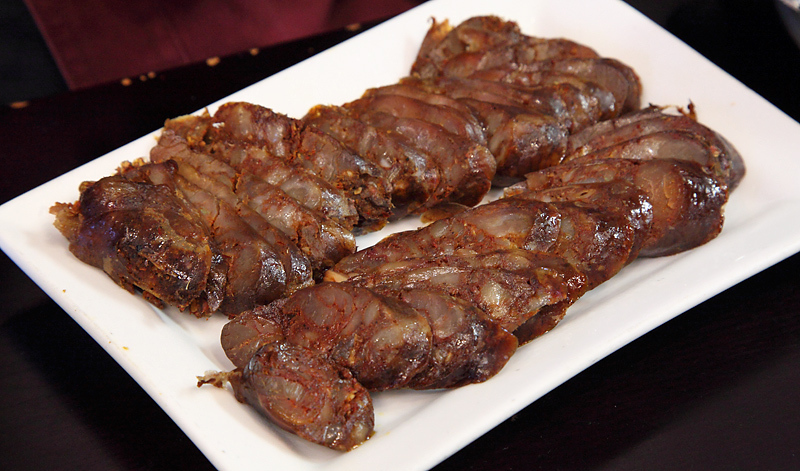 Lightly dusted with Sichuan spices, this pork candy hardly needed much embellishment. Peanuts a nice touch though. If I have one nit about this place its the prices. This reasonably portioned lunch for two set us back $48 with tip. The pig feet alone were like $14.99. Worth every cent though. Flock here! Happy to report round 2 roasted pig feet (now with plastic gloves!) and wonton in hot soup retain their best-things-I've-eaten-this-year status. Pig feet even meatier and ever so sticky-icky. Delicate wontons gracefully dance in their electro broth. The spicy soft bean curd was also on point with more of the salty/sour minced pickle. The weakest dish of this visit was the bell dumplings, which might fare better on a lesser table (comparable to Chengdu dumplings at other spots.) But the sweet-ish shrimpy filling and basic chile oil/soy dressing proved no match for the fireworks of the wonton in hot soup. I had been eyeing this place, but the high prices for "street food" and the fact that I actually found Chengdu street food a bit underwhelming when I visited had kept me away. The glowing reviews here redirected us Friday night. We ordered the spiced potatoes, the wontons in hot soup and the pig feet. The very good seasoning on the potatoes reminded us of a similar potato dish we ate in Xi'an, though this one was a bit sweeter and had a bit too much "ma" even for me, let alone my wife. However, the real problem here was that I am 90% sure that these are store-bought frozen crinkle cut fries that aren't even reheated well as they are still quite firm. A properly prepared version with fresh boiled potatoes quickly fried in the spice mix would be inimitable. The wontons were glorious. Flavorful filling in perfect slippery, tender wrappers. I can't say I have ever eaten a better one. Bonus points for a hot/sour broth that has way more character than a typical wonton soup. Then we come to the pig trotters. These look amazing, just like the pictures shared here. However, I can firmly say that my skepticism about the price was justified. The problem here is that it doesn't have any flavor. Yes they are sticky with gelatin and jiggly fat, but that is the least you should expect from a Chinese pig foot. You can literally go down the street to Min's Noodles and order similar braised pig feet for less than half the price of these. Curiously, Min's also managed a rather bland version of this dish. Overall, the overpriced and underwhelming pig feet and frozen potatoes kind of turned me off the place despite the magnificent wontons. It will be hard to find the urge to visit again with good Taiwanese eats nearby or Homestyle Taste a bit further down the street. I had a great meal here back over the winter and had looked forward to returning. But the second time around, a recent group lunch, was more of a mixed bag, though I did enjoy some of the items we shared . . . Loved the dense, chewy texture but thought they were pretty one-dimensional flavor-wise. Chili oil definitely helped them along. One of my favorite items this time around. The wrappers were light and supple. 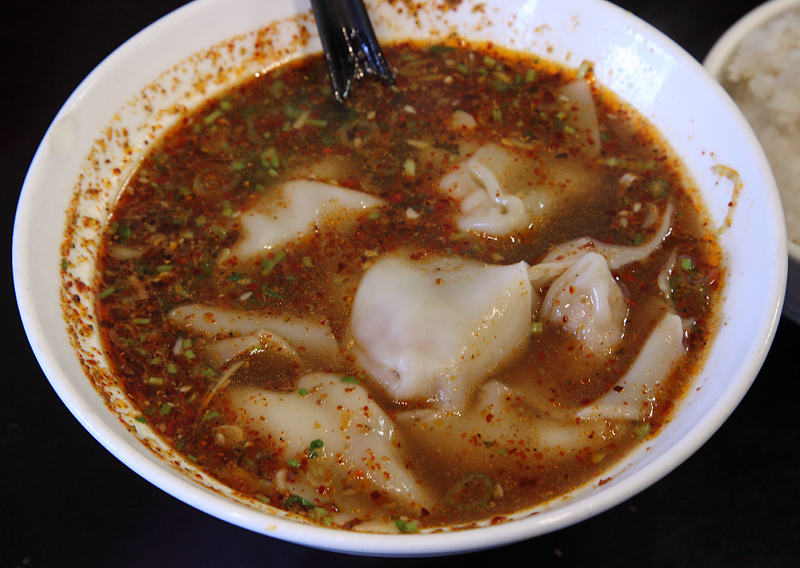 I loved the intense broth and thought the wonton filling had great flavor. Good stuff but nothing that cannot be had at many other places -- at roughly the same level. This dish I just did not get. Not even the delicious 'spicy business' in which they were smothered could save these severely soft, seemingly-undercooked foodservice fries. I really liked this last time out and the texture was great but I thought the dumplings themselves were devoid of flavor. I enjoyed this dish quite a bit. 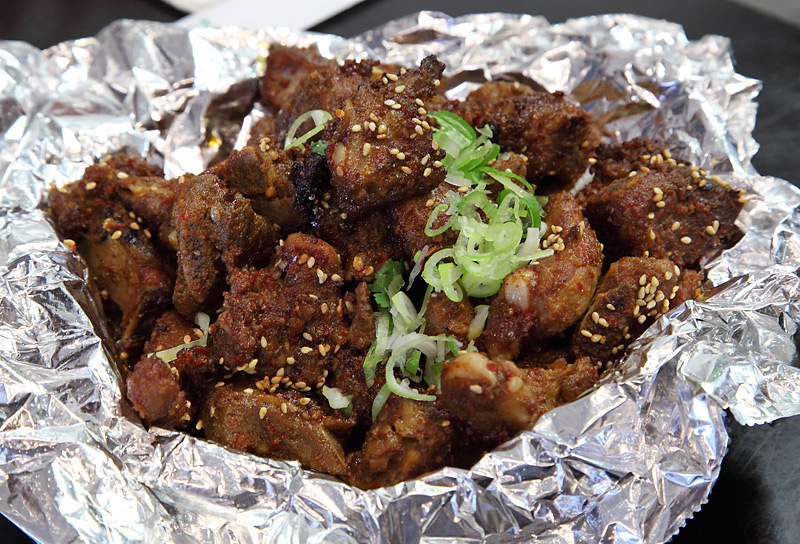 The sticky, crunchy, gelatinous texture was really satisfying and the pork flavor and spice were there, too. Just fine but a shadow of what they were the first time out. That time, they seemed a lot fresher and brighter. It seemed like the same sausage this time but more tired.